Some old school wine enthusiasts might turn their noses up at the mention of a wine aerator, but they do give some wines a lift. By forcing air to be circulated throughout the wine, it expands the surface area of the wine and the aromatic profile along with it. Most of the designs are messy affairs. They are held above the glass while you pour the wine. As it pours, bubbles are sent through the wine when you don't have time to let it breathe naturally. The downside is that most aerators consider the glass instead of the bottle. The Menu Wine Breather Carafe skips an aeration step. Nobody really wants to pour a glass of wine through an aerator and then set it aside for the next glass. It makes more sense to aerate the entire bottle and enjoy the wine until uncorking the next bottle. A couple of years ago, a specialty design company in Denmark set out to do just that. 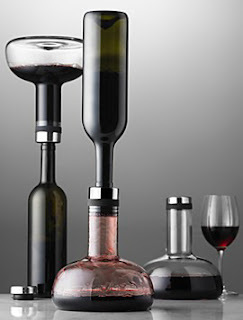 They came up with a carafe concept that allows for an entire bottle to be turned upside down, aerated, and then served. As an additional option, you can decant it twice by pouring it back into the bottle and serving. The video was one of the first reviews of the product by Tim Vollerslev, a chief sommelier and beverage advisor. What is especially worthwhile about the review is that he also shares how using the decanter can also help remove any sediment from an older bottle of wine. The carafe is a simple Danish-inspired design, made from glass, steel and a plastic inset created to aid in the aeration process. It only takes two minutes to aerate a bottle, which is significantly less than the 60 minutes or more that some wines require (although some people I know never let it breathe). A few graphs about Menu, a design company in Denmark. Originally founded by Simon Hansen as the Danish Steel House in 1979 (to provide steel products to catering businesses), the company took on the brand name Menu in 1998 as it began to expand its designs. Some of the names associated with Menu might even sound familiar. Bjarne Hansen developed a famous coffee set that originally pushed the company beyond steel. Pernille Vea joined in 1998 to create a new world of design innovation. And nowadays, the designers have expanded to include Jackob Wagner, Christian Bjorn, and dozens of others from all over the world. Their designs, usually limited, range from artfully functional to artistically smart. Even the carafe goes beyond being creative in ways that most people miss. The broad base was specifically designed to decant the wine properly. 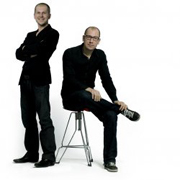 The original designer for this carafe was Jonas Bjerre-Poulsen and Kasper Ronn (above), who make up the team Norm. A variation of the carafe was recently introduced by Louise Christ, also of Denmark. A few additional wine accessories for the always curious. Another great idea comes from Gorham. It's a bright stainless steel bar accessory set that features a ratchet wine pull, foil cutter and wine pouring spout. It might seem overtly simple, but the single handled ratchet beats the traditional pulls any day of the week. This one works especially well, fixing perfectly on the bottle while lending a contemporary design. The Menu Wine Breather Carafe Uncorks 6.8 On The Liquid Hip Richter Scale. Menu produces all sorts of great design and the original carafe is no exception. It's often very eclectic and frequently showcased by top department stores. As a result, the designers and even the company don't always receive the recognition they deserve outside of design shows. I'm glad to include them here. You can find the Menu wine breather carafe at Bloomingdale's or purchase one from Menu on Amazon. As for the other great wine gadget accessories, the Gorham set can also be found at Bloomingdale's while the Corkcicle can be ordered from the company direct. The latter is especially cool with some of the new stoppers they've added. It might even work as an assist for vodka.